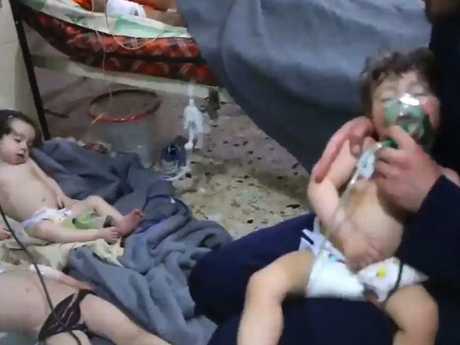 VOMITING, foaming at the mouth and shaking uncontrollably - Syrian families who were gassed by their own leader have revealed what it is like to endure a chemical attack. Survivors from the town of Douma, now staying at a camp in northern Syria, said the first sign something was happening was a series of bangs like something falling, and a hissing noise. A mother named Amani told the Sunday Times how two men went to check on what had happened and came back screaming "Gas! Everybody out!" She said she saw white gas and dust falling down around her as she fled from the basement where civilians were hiding from government barrel bombing of the rebel-held town near Damascus. "The gas was spicy," said the 34-year-old. "Spicy in my throat like chilli. I was vomiting and coughing. No one could breathe. Around me, people were just falling to the ground." Amani poured water over her daughter Masa's mouth before briefly passing out with her seven-year-old child lying next to her, foaming at the corners of her mouth. She saw others convulsing on the ground, pouring water over loved-ones or crying over relatives. "My whole body didn't work," she said. "When I was climbing the stairs I could feel myself losing strength. I couldn't control my body. I was just shaking the whole time. There wasn't oxygen." Amani was one of the lucky ones - she had a warning. Neighbours sheltering in a basement next door were not so fortunate, and all died where they were. At least 34 people were killed in the chemical attack carried out by Syrian president Bashar al-Assad. He denies responsibility. 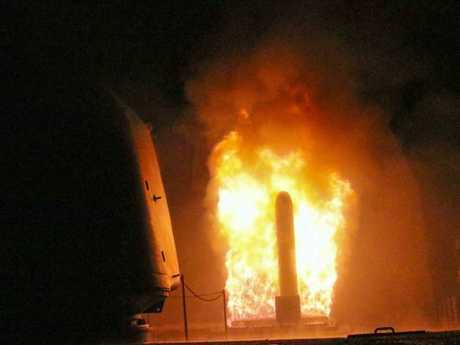 The attack one week ago, which triggered the retaliatory strike by the United States, United Kingdom and France on Saturday, is believed to have been carried out using commercially available chlorine. Experts reached this conclusion after studying photographs showing yellow canisters at the scene of the devastation. The accounts given to the Times by some of the 3000 survivors appear to corroborate this theory. People described smelling chlorine and seeing a yellow gas that turned into thick, white smog. They reported feeling their throats burning and losing control of their bodies. Local civil defence volunteers the White Helmets said they believed the effects were like that of chlorine mixed with the nerve agent sarin, which the Syrian government used against civilians in nearby Ghouta back in 2013, killing at least 1400. Shocking images have emerged of adults and children collapsed or dying in the streets after the attack. But conspiracy theories have been spreading that the photographs were faked by the West to provide an excuse for an attack on Syria. Chemical weapons have killed hundreds of people since the start of Syria's conflict, with the UN blaming four attacks on the Syrian government and a fourth on the Islamic State. After the attack on April 7, rebels handed in their weapons and left the town. And some of Donald Trump's most loyal supporters have turned on him over his decision to strike three Syrian chemical plants in response, charging him with breaking his promise to keep the US out of another war in the Middle East. Paul Joseph Watson, an editor at conspiracy theorist site Infowars, said on Twitter that Mr Trump "was just another deep state/neo-con puppet," adding, "I'm officially OFF the Trump train." Meanwhile, Syria showed it was undeterred by the Western attack, launching air strikes on remaining rebel strongholds north of Damascus a day later, shelling what rescue workers said were civilian homes. 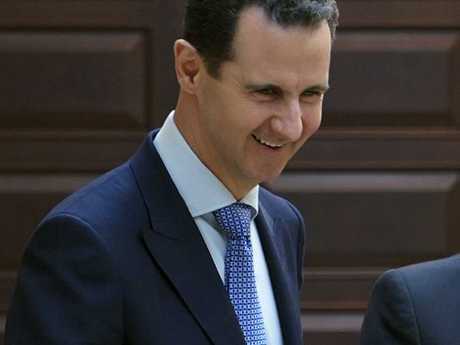 Mr Assad told Russian politicians visiting Syria on Sunday that the US, UK and France were spreading "lies and misinformation" about his regime. Malcolm Turnbull slammed Russia for supporting Syria and said Australia could join future military action against Mr Assad's regime, as the US warned it was "locked and loaded'' in case it needed to strike once more.